If you’re new to the dark works of Malcolm Mackay, then you’re in for a treat – but this isn’t the place to start the journey. 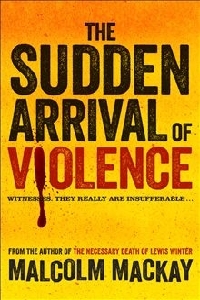 The Sudden Arrival of Violence is the much-anticipated final installment of the Glasgow Trilogy, a hard-boiled, hard-talking trip through the mean streets of inner-city Scotland. Look out for part one, The Necessary Death of Lewis Winter; and part two, How a Gunman Says Goodbye, get yourself up to speed, then sit back and hold on tight for when the violence arrives. Calum MacClean is a freelance wet boy, a hit man for hire who plies his trade in a fictional Glasgow underworld, where turf wars are rife as rival gangs fight to control a lucrative drug trade. He’s good at his job, in demand even, but he won’t take sides. How long can he remain non-partisan in a world that demands die-hard loyalty? In The Sudden Arrival of Violence, Calum’s had enough. It’s time for the killing to stop, but the war is escalating and heading for a climax from which only one gang will emerge victorious. Malcolm MacKay was born, and still lives, in Stornoway, a town on St Lewis in the Outer Hebrides, the remote islands off the west coast of Scotland. Despite this apparent isolation, Mackay peers straight into the dark heart of Scotland’s second city to create works of fiction that you just can’t put down. Mackay is the latest in a line of critically-acclaimed authors of Scottish crime fiction – Tartan Noir – which also includes Ian Rankin (Inspector Rebus), Val McDermid, Christopher Brookmyre. That’s some pedigree. Don’t let the millionaire American thriller writers take over the world! Here’s a new voice in crime that demands the attention of every fan of original and exciting crime fiction.